MPAA Rating: PG-13 for sequences of sci-fi action and violence (also contains language). Please stay for the mid-credits dedication. Running time: 122 minutes. 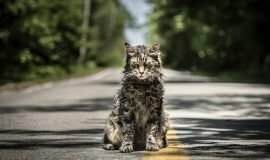 Released by Paramount Pictures. Author’s note: this review, like the movie itself, is dedicated to the lives of Leonard Nimoy and Anton Yelchin. 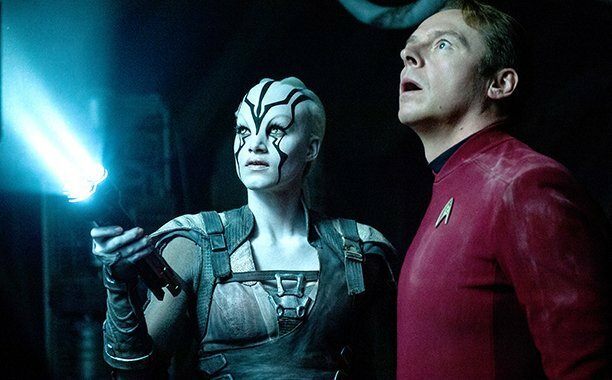 Everyone knows the Star Trek film curse: the odd-numbered Prime (read: William Shatner era) Star Trek films fell short of their intended reception, while the even-numbered films were the best of the series. So far, the Kelvin Timeline Star Trek films (the reboot films starting in 2009) have shown a spectacular first entry and a flawed (yet still decent) second entry. 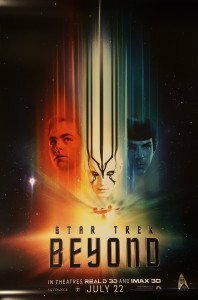 Does Star Trek Beyond, the third in the Kelvin Timeline films conform to the every-other-Star–Trek-film-is-good/bad continuity? 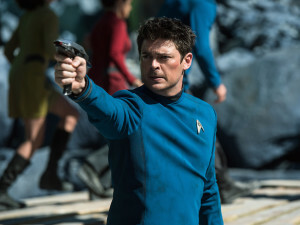 The answer is an unequivocal “yes.” Star Trek Beyond stands as one of the best of any of the Star Trek movies, being both an outstanding actioner and a neat little nod to daily lives here in Stardate 2016.203 (using the Kelvin Timeline Stardate measurement). The screenplay, by Simon Pegg (who also plays Chief Engineer Montgomery Scott, a.k.a. Scotty) and Doug Jung, manages to slip in some sly social commentary, which Star Trek creator Gene Roddenberry went to great pains to include in all iterations of the TV shows and films. Director Justin Lin, whose notable growth as an action director was demonstrated by the successively improving qualities of The Fast and The Furious: Tokyo Drift, Fast & Furious, Fast Five, and Furious 6 takes the helm from reboot director J. J. Abrams, who steps back to a role as the film’s producer. Lin uses his trademark high action style to inject the film with massive kinetics and gravity-bending spectacle, thanks to Fast & Furious collaborator Stephen F. Windon in charge of cinematography. We’re spun through distant planets, nebulae, space stations, and starships alike while we follow Captain James T. Kirk (Chris Pine) and his crew in the middle of their five-year mission to explore new life and civilizations. But when you’re stuck on a spaceship for five years, life would get to you, wouldn’t it? Even in our time, three years at the same desk would seem like an eternity, and it’s getting to Kirk. 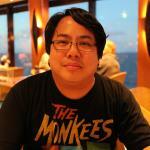 In his Captain’s Log, he notes how this is affecting life everywhere on his ship, the U.S.S. Enterprise, with relationships starting and dissolving with no room for either participant to escape. Also affected are Captain Spock (Zachary Quinto) and Lieutenant Nyota Uhura (Zoe Saldana), who seem to be on the outs. 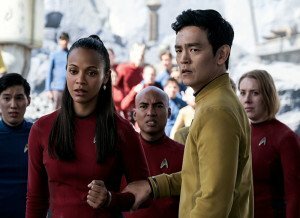 Lieutenant Hikaru Sulu (John Cho) is missing his daughter and his partner. 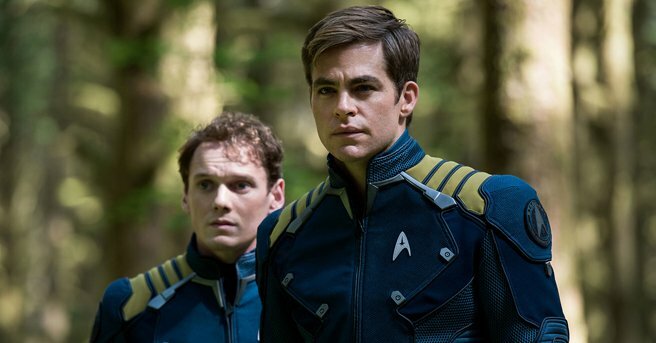 Ensign Pavel Chekov (Anton Yelchin) remains wide-eyed and loyal, while Scotty remains as happy as a clam in the flagship vessel of the United Federation of Planets. Meanwhile, ornery Ship’s Doctor Leonard “Bones” McCoy (Karl Urban) keeps a weather eye on everything, including Kirk’s burning out on the job. Everyone’s problems get put into sharp perspective when an alien overlord named Krall (Idris Elba) declares war on the Federation by destroying the Enterprise, killing her crew, and imprisoning those (un)lucky enough to survive the attack, which includes most of the bridge staff. Those who escape are left with no weapons or badly wounded, turning to former Krall prisoner Jaylah (Sofia Boutella) for help, who, in turn asks for their help getting her off the planet. Right from the title-less start (the film makes you wait through the first part of the closing credits for the title, after which you should stick around for about fifteen seconds), we see the crew we’ve come to know and love these last 7 years, and it’s a great feeling being around them. Their easy camaraderie as actors comes through in their performances, and it’s like visiting a family you want to be a part of, and whose spirits you can’t help but love. For these 122 minutes, Lin makes the most of their characters’ personalities and further endears you to them with conversations about the job, mortality, and their friendships. For instance, you have no choice but to admire the unlikely pairing of Spock and McCoy – who’ve been at each others’ throats since their Starfleet Academy days – in action scenes and as verbal sparring partners. Urban’s “crotchety old man” performance blends unexpectedly well with Quinto’s cool (even in the face of severe injury and blood loss) and logical Spock. Their scenes together steal the film from under the rest of the cast, all of whom are performing at the top of their respective games. Jaylah is a wonderfully-written character, a Robinson Crusoe of sorts who’s capable and ready for action. She holds her own mentally and physically with the rest of the crew, and I know I’m not alone in hoping we see her in future Kelvin Timeline films. 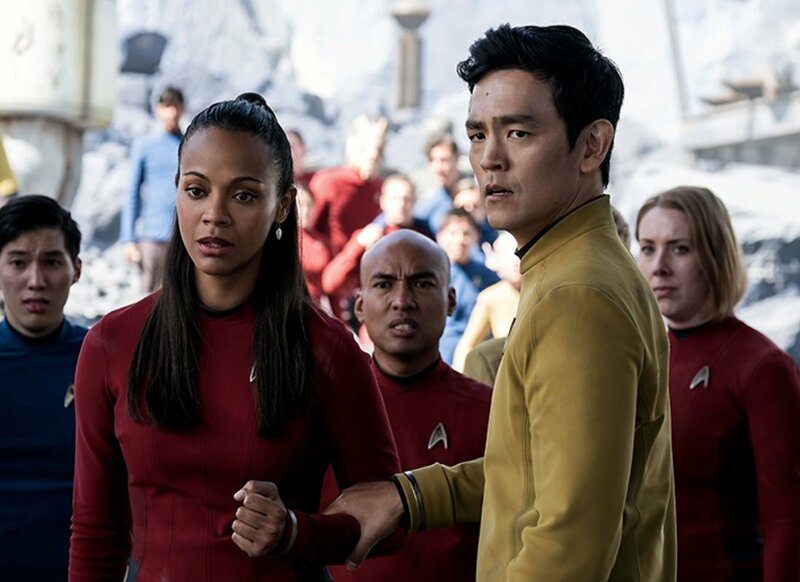 Star Trek Beyond beautifully handles having lost two of its actors within 478 days of each other by celebrating their legacies and their characters, delivering dialogue which serves as both in-universe and real-life tributes. Listening to Spock’s monologue about Spock Prime (Leonard Nimoy) could (and should) be taken as Quinto giving an honest riff on the life of Nimoy himself. When Kirk toasts “to absent friends,” take note of who centers the next shot. These deliberate nods to fallen comrades mean more than just a simple dedication; they’re part of the Star Trek family, which means more than just the actors. It means a network of fans the world ’round who are also missing these actors just as much. 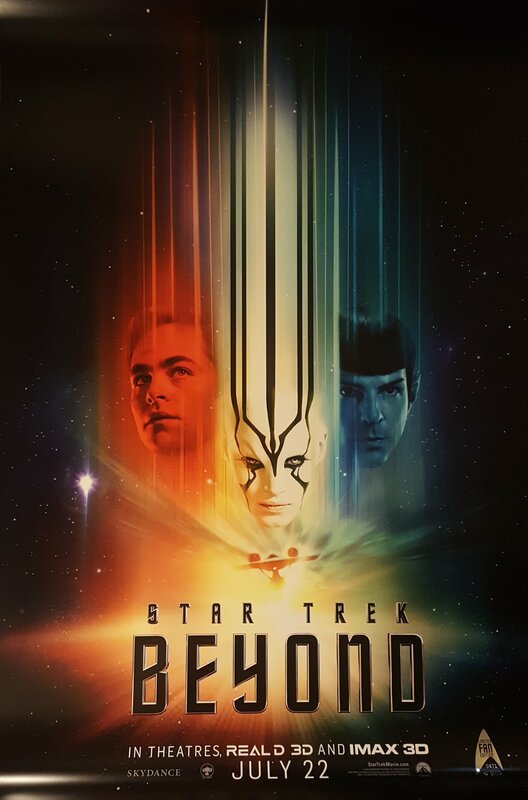 To see them sent off in the manner which Star Trek Beyond grants them is at once joyful and heartbreaking, forever immortalized in a spectacular film co-written by one of their own. Great review! 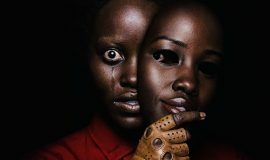 The end of your review gave me chills (the good kind)!